We’ve all made mistakes traveling. Here are a few that could be called “typical” and should be avoided. Not doing your research on your final destination. Weather, timezone, customs, currency, language, culture and other factors could put you in a spot of bother. Assuming your final destination will have all the required transport facilities at your disposal upon arrival to get you to your accommodation. Using hotel communication systems including the phone and fax. If you’ve done this, they’ve no doubt, nailed you! Consuming the contents of the hotel room mini-bar. Don’t do it! Go to the local store and buy a couple of drinks there, it will save you a bundle. Not giving yourself enough time between flights. It can take up to an hour to get out of a 747 after landing and then you may still have to get to another terminal or airport for your connecting flight! Give yourself plenty of time to avoid missing your flight. Booking a day tour without shopping around. You might be getting suckered! Not paying in local currency. You will be doubly losing. Once with the exchange rate used to convert into your currency and once more back into the local currency to get your change. Not booking accommodation for your final destination during high season, a conference or festival. You might find yourself sleeping in the street. Trying to pack in too much activity into a specific period of time. 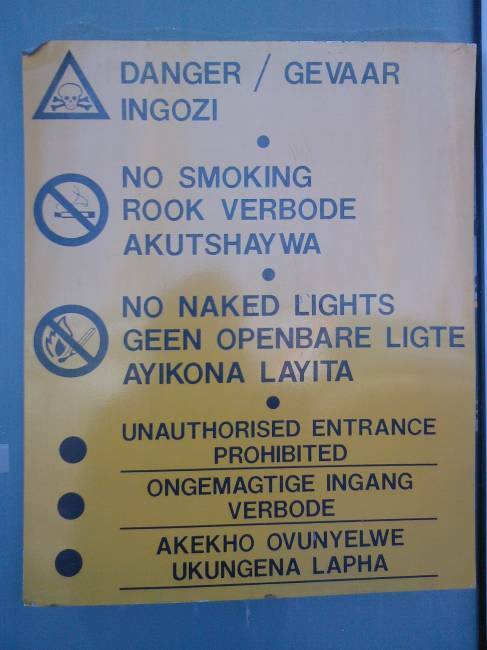 Hehe, this picture is quite funny…It seems to have been translated by someone with a Afrikaans – English Dictionary. This person probably decided to use the wrong translation to forbid “open flames”. Naked lights, never heard of ’em! Just saw this movie, yes, I know, a bit behind a lot of you…Well it’s because of where I live! Anyhow, it matters not. The Simpsons, the movie, just like the TV series does not disappoint. The humour starts right from the word go with Ralph making the very first appearance of all the characters. The movie is also one to cover one of the most pressing issues of our time, if not of mankind, the environment. It does so just like Al Gore did, in a public friendly, easy to understand, way. I think it’s great that the creators, writers and actors all teamed up on this issue and publicise, with what will inevitably be one of the most popular movies of the next few months, a deadly serious issue like Global Warming and pollution in an idiot friendly way.